Dianne attained her Bachelor of Dental Surgery from the University of Adelaide Dental School in 1992. During her undergraduate career she completed several research projects under the supervison of esteemed Drs Graham Mount and Owen Makinson. Results from her research was subsequently published in The American Journal of Dentistry: Am J Dent 1992, Oct-5-286-288. In her fifth year at Dental school, she was awarded the Colgate­ Palmolive Research scholarship- in which she undertook a research project at the Cardiff Dental school – Wales, UK. Dianne was awarded the J.Verco prize for General Dental Practice in her final undergraduate year. She has worked in both the public and private sectors and has an interest in endodontics. Dianne has actively attended continuing education forums. Dianne enjoyed her years as a Councillor, Secretary /Treasurer and President of the Australian Society of Endodontology- SA branch. She has also served as a Councillor on the SA branch of the Australian Dental Association. Equally rewarding, was her tutoring and mentoring role of dental students in the teaching clinics of the Adelaide Dental school. 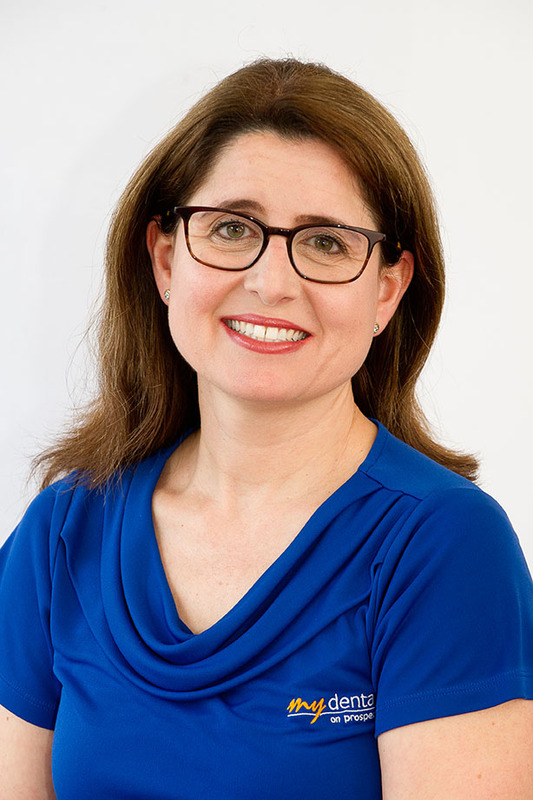 Dianne established Mydental on Prospect in 2006 – her aim was to establish a quality dental practice with the latest technology and to focus on patients’ needs – providing them with the best experience possible. She is a caring, gentle dentist who listens to her patient’s concerns and provides dental care to suit their individual needs. Dianne enjoys treating children and families and it is a testament of patients’ trust in her, that she is now providing dental care to three generations in the same family. Outside of Dentistry, Dianne is happily married to David and has two energetic, sports mad teenage sons who keep her busy outside of Mydental. She loves cooking and entertaining with family and friends. Dianne enjoys taking her golden retriever Nelson for daily walks. Todd enjoys listening to a client to understand their needs and concerns, and then working together to create an active management plan. He looks to empower each client to achieve lifelong oral health by tailoring dental care to suit their individual circumstance. Whether a client is nervous, in pain, or confident of what they want, Todd looks forward to creating a positive dental outcome. Todd is married with four children and three dogs. When not at work, he enjoys spending time with family and friends. When younger he worked in Antarctica as a physicist and was an academic at Flinders University. He trained at the University of Adelaide and is a long-time resident of the beautiful city of Adelaide. 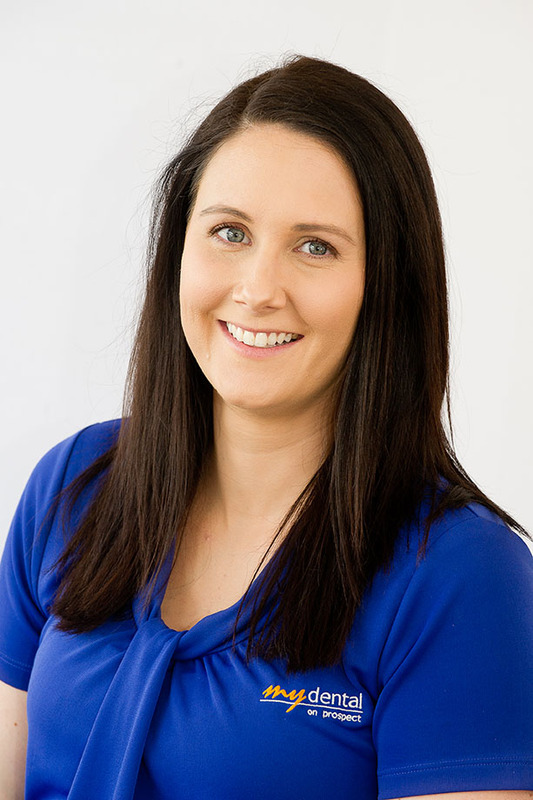 Lisa joined the Mydental team in 2009 after graduating with a ‘Bachelor of Oral Health’ degree in 2008. In 2007 she was presented with an award by the Dean of the dental school for attaining the highest standard of dental and health science. After graduation, Lisa was elected secretary of the Dental Hygiene Association (SA Branch) where she volunteered for 3 consecutive years allowing her to network with other oral health therapists and dental specialists within Australia. Early in her career she gained invaluable experience working with children (including those with special needs) at a specialist paediatric dental clinic. She enjoys working with the Mydental team because every patient is valued and cared for like they are part of the family. Lisa prides herself on providing gentle and thorough dental treatment and is experienced in treating anxious patients. She has a special interest in the link between oral health and systemic disease and the importance of preventative dental treatment. Lisa is registered with the Australian Health Practitioner Regulation Agency and has current membership with the Dental Hygiene Association of Australia. She holds a current radiography licence. When Lisa isn’t at Mydental she works part-time as a clinical educator at Adelaide University. Outside of work she enjoys playing with her spoilt yellow Labrador ‘Bonnie’ and is a self confessed ‘chocoholic’ so can empathise with patients who have a sweet tooth ..
Brooke has been in the Dental industry since 2011 after graduating school in 2010. She has a certificate III And IV in Dental assisting in addition to her radiation license. While not at MyDental she works part time at another private practice in the North Eastern Suburbs. Brooke also has experience of working in a Periodontist ‘specialist’ practice. Outside of work, Brooke is an over obsessed dog lover who cannot wait to get a dog of her own.. a golden retriever. She loves spending time with friends and travelling to America where she grew up for 6 years and where some of her family currently live. Kyla graduated with a Bachelor of Oral Health at the University of Adelaide in 2004. She is a passionate Oral Health Therapist, with experience in private dental practice and public dental service. Kyla has dedicated four years of volunteer service as a Dental Hygienists’ Association of Australia Executive Committee member, was employed as Oral-B’s dental schools’ speaker, and participated in other community oral health promotion activities. Kyla is currently engaged in a variety of clinical education roles for the teaching of dentists, oral health therapists, dental hygienists and dental assistants at the University of Adelaide and TAFESA. In her own time Kyla loves to be with her family and friends, supporting the Adelaide Crows and indulging in delicious food and wine. Priscilla has completed the Bachelor of Oral Health at the University of Adelaide. She has previously worked as a dental assistant since 2013 which sparked her interest in the dental field. Over the years she has adopted a gentle approach to patient management of anxious patients. She is a strong advocate for prevention and oral hygiene. Priscilla regularly keeps updated by attending dental seminars and conferences to further develop her knowledge and skills. She is a member of the Australian Dental and Oral Health Therapists Association and The Dental Hygienists Association Australia. When not at MyDental, Priscilla spends her free time taking her dog Pickles for adventures, reading Stephen King novels, travelling and learning how to cook different cuisines. Madi has been a part of our team for over 5 years. She completed her Certificate Ill in Dental Assisting in Victoria in 2011 and then Completed Certificate IV and Radiography in 2014 at TAFESA. She shows great enthusiasm and enjoys working with patients and ensuring they feel comfortable. In her spare time she enjoys spending time with family and friends, being with her pets and cooking. Nicole joined the mydental team in 2010. She completed her Certificate Ill in Dental Assisting in 1999. Nicole works primarily at front desk and occasionally also works alongside the dentists in the treatment rooms. Making patients feel comfortable about all aspects of their dental care is a priority for Nicole, who knows that a positive dental experience is significant to a patients overall dental health. Having 2 small children herself, Nicole will always strive to make your child’s dental visit a happy and stress-free one. Kathryn has been a part of the My Dental team since 2012. She has a Certificate Ill in Dental Assisting. Kathryn has worked in the dental industry for over 25years. Her friendly demeanour always makes patients feel welcome and at ease. She enjoys getting to know each and every patient. Kathryn enjoys watching and playing sport, especially tennis and basketball and spending time with her family. She is also a Partylite candle consultant and keeps the practice smelling delicious. Sarah is a new addition to the Mydental team. She completed her certificate III in dental assisting during her traineeship with the Adelaide dental hospital in 2016. She loves to connect with patients on a personal level and is very dedicated to giving patients the best care, making them feel comfortable and putting them at ease with her bright, bubbly personality. Outside of Mydental Sarah enjoys spending time with family and friends, but most importantly her two mini dachshunds! Sheridyn has been a part of the My Dental team for 7 years. She has a Certificate Ill in Dental Assisting and Certificate IV in Dental Radiography. Sheridyn has worked in the dental field for over 16 years which has had her working as a Dental Assistant in Queensland and the UK. She enjoys getting to know patients on a professional and personal level and ensures patients feel welcome when attending My Dental. 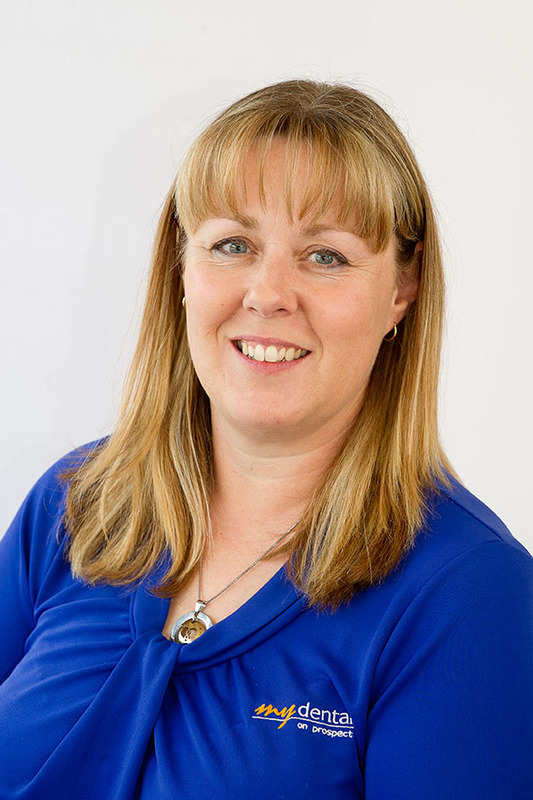 Sheridyn enjoys spending time with her family, travelling overseas and when she is not at My Dental she runs a plumbing business alongside her husband.